Jacob Derksen – Blog 2: So far, so good! 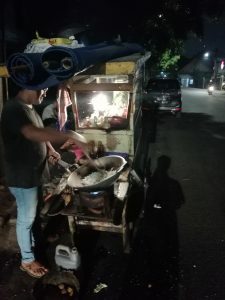 From skyscrapers and minarets that rise above the smog and malls that make Mayfair and Uptown look like corner stores, to pushcarts-turned-cafeterias serving nasi goreng and sate ayam to motorcycle-taxi drivers on quiet side streets, Jakarta, Indonesia is an incredible part of the world to have the opportunity to both explore & live in. 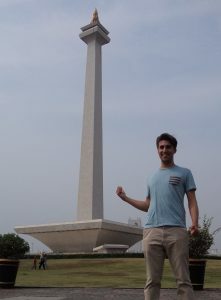 Monas- the heart of Indonesia..
I’m so glad to have finally arrived and cannot believe I’m already a month into my placement with the Center for Indonesian Policy Studies- a political think tank based here in Kebaroyan Baru, South Jakarta. The internship program here at CIPS (that’s ‘chips’ not ‘sips’, as c=ch in Bahasa..) is really great, and is structured in a way so that interns get a deep and holistic understanding of the organization. I get the opportunity to spend about 1.5 months in each of their 4 departments- Research, External Relations, Operations, and the Online Academy. CIPS is home to about 15-20 people, and I’m joined by 5 other Indonesian interns. Sadly, they are just here until September, but I’ve had lots of fun with them over the past month, and they’ve been great help. I’m sure we will definitely all stay in touch. A fantastic component of the internship program is a series of Internship Training Sessions, run by various people around the office. These 11 sessions are super informative and provide great background about the organization, how it works, what they do, why they do what they do, as well as their goals for the future. To start off, I’m with the Online Academy, or Akademi CIPS department. This is the organization’s online learning platform. Akademi CIPS is brand new and is basically a startup, so I’ve been given a lot of responsibility and am learning so much everyday. Things are busy busy, as we’ve just launched our Food Trade Course, in conjunction with CIPS’ HakMakMur Campaign, which I will describe in a bit. So far I’ve overseen an overhaul of the website, presented on the research I’ve done into Online Learning trends both internationally and in Indonesia, and right now I’m actually overseeing the development of our second course, on Effective Communication and Public Speaking, to mention just a fraction of what I’ve done in this first month. As I’ve done all this research into online learning, specifically about Massive Open Online Courses (or MOOCs) it has actually peaked my interest into this emerging industry. Platforms like Coursera, edX, and Udacity (and soon in Indonesia.. Akademi CIPS! ) offer countless free online courses from universities and experts all over the world.. who knew! Meeting with streetfood vendors, letting them know about the HakMakMur Campaign..
As mentioned, CIPS has just launched their HakMakMur Campaign – a campaign to lower food prices in Indonesia by reducing tariffs on food imports. Currently, the government is pursuing a policy of food self-sufficiency, but this is causing prices to rise as there is not enough supply to meet demand. 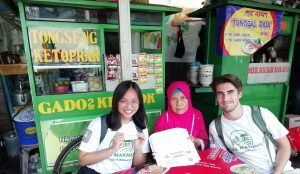 As part of the campaign, the CIPS interns and volunteers (including me) have been out and around Jakarta, meeting with streetfood vendors located near key government offices in order to raise awareness of our campaign. We’re letting them know about the campaign and giving them food wrappers and take out boxes with information about the campaign printed on them. As the target locations are near important ministry buildings, they are frequented by civil servants and politicians daily, so when they order their lunch, they’ll see our information. Pretty creative idea. CIPS Interns favourite lunch spot! One of my favourite parts of Jakarta so far is the food- you can get anything you want, from Italian to Korean, to Japanese, to North American fast food places.. But Indonesian streetfood is always the way to go. It’s delicious, inexpensive, and everywhere… dan banyak pedas! Crazy spicy too, wow! Lots of rice, noodles, chicken, fish, and vegetables. There’s a huge variety, with dishes coming from all around the archipelago, and each part has its own tastes and specialties. Makeshift food stalls, called warungs or push carts called kaki limas line the side of many streets. (kaki lima translates to ‘five feet’… 3 from the cart and 2 from the chef!) It’s always hard to decide which one to go to and I’m not sure if 6 months will be long enough to try everything! 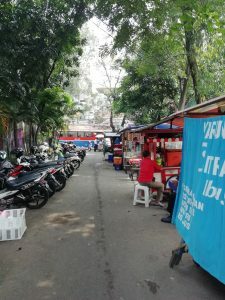 People say Jakarta has some of the worst traffic in the world ( I can believe that), and so my main hope when looking for a place to live was to be close enough to work so I could walk. This city is great for a lot of things, but I would say pedestrians are not one of them. My insistence on commuting and exploring the neighbourhood by foot has been quite the adventure, and has garnered quite a few puzzled looks. Luckily, I have found a place to live that’s only a 5 min walk to work, which is great! Really getting to know the neighbourhood… Kebayoran Baru feels like home already. I’m living in a kost, a type of accommodation in which you have your own room and bathroom, but share a common kitchen and living space with other people, usually students or people here working. Kosts are common as a huge number of those living in Jakarta are not actually from here- but other parts of the country, and are in the big city to work. Jakarta is definitely a mosaic of people from all over this vast and incredibly diverse country. At first I was a little unsure about living at this kost.. the room is very very small and lacks a window, but this uncertainty has since faded. Regardless, I want to spend my free time here exploring, not in my room. I’d take this kaki lima over any 5 star restaurant! Hadi, the guy who works and lives here with his wife, is about my age and I’ve really enjoyed my time hanging out with them, whether its just relaxing in the living room eating dinner and watching the FIFA game, or riding around the neighbourhood on his motorcycle. We’ve become good friends and he’s made my experience here so much better. Oh, did I mention he doesn’t speak any English at all? That just goes to show how friendly and welcoming the people here are- all you need is a couple words of broken Bahasa and Google Translate to make some great friends. I’ve actually already made many great friends, often in the most random spots. Even my first few days staying at a nearby hotel while getting settled led me to find another group of friends. Although most of my friends speak English, hanging out with Indonesians is a great opportunity for me to practice my Bahasa! While here, one of my big goals is to learn as much Bahasa as I can. Right now I know enough to survive, and know a handful of basic words (a lot of them to do with food..). Luckily, as far as languages go, Bahasa is an ‘easier’ one to learn, so I’m hoping by December I’ll be pretty good.. Its taken awhile but I’ve found a tutor to help me, and I’ll be taking one lesson per week, via Skype, to help start to put all the words I’m learning together. Everyday I manage to add a couple words to my vocabulary, as you would say in Bahasa, pelan-pelan – step-by-step! 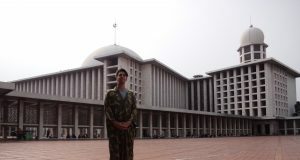 At Istiqlal Mosque- the largest in Southeast Asia, which can hold 200,000 people! My friend managed to get me some appropriate dress! Now that I’m settled, I’m looking forward to continuing my exploration of this metropolis, as well as getting out of the city and start exploring Western Java on the weekends- visiting other cities, going on hikes (like I will be this weekend!) etc. Another thing to look forward to is the Asian Games, (essentially the Summer Olympics, in Asia) which are being co hosted by Jakarta in August. I’m doing my best to try and get a ticket to the Opening Ceremonies.. but still trying to figure that out! 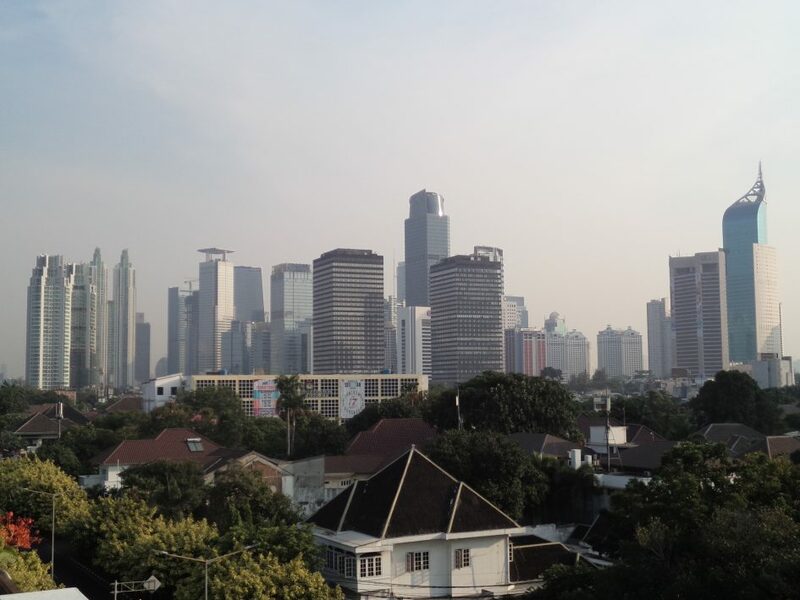 I’m doing alright here in Jakarta- and it is all thanks to the enormous generosity and boundless friendliness of the Indonesians I have met .. (with an honourable mention to Google Translate). Looking forward to spending the rest of my placement in Indonesia, and continuing to learn, push myself, and be awed at this incredible country.  My name's Jacob, I'm studying Anthropology at UVic, and I'll be in Jakarta, Indonesia working with the Center for Indonesian Policy Studies. CIPS is a political think tank that focuses on policies involving Trade, Education, and Community and Livelihood. Politics, and how it effects people's lives, is really interesting to me so I'm really excited for this opportunity.